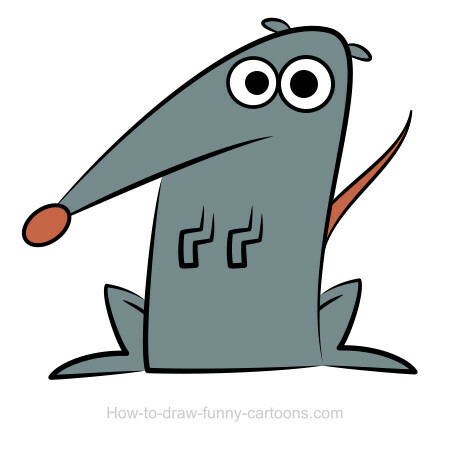 Knowing that we are about to create a rat drawing might not be the most exciting thing in the world, but trust me, this drawing lesson should be quite entertaining! Indeed, the cartoon character designed for this tutorial is very interesting. This is a rare example from this series to have a very simple design and very few details. Therefore, this is the perfect drawing lesson for those who are not familiar with cartoon characters from this collection. 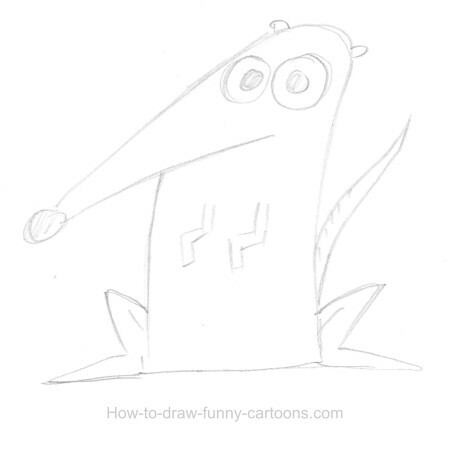 Of course, sketching is the first thing you must do to begin this drawing lesson. 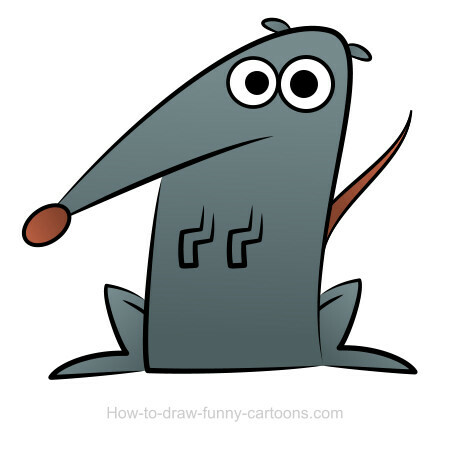 The bottom of the sketch is not very detailed or polished, but you get the idea of how the rat should look like. Now that your sketch is done, scan or take a picture to use this illustration as a template. Then, draw dark outlines on the picture using the appropriated tool. To add colors, you must create a new layer behind the original one. You can use plain shapes for now. 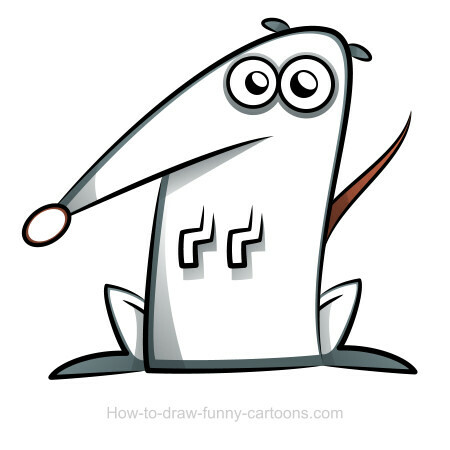 Notice that the same color is used to fill the nose and the tail. Select your gradient tool and add a subtle shadow using two colors that are almost similar. 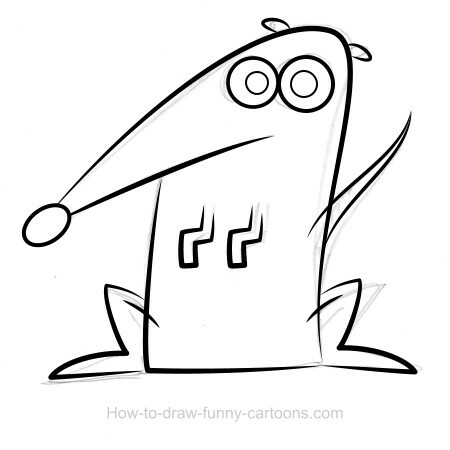 Repeat this step for the body, the nose, the ears, the tail and the arm in front of the character. Create new shapes placing a layer between the outlines and the solid shapes. These new elements will be used to create shadows so that the 3D effect will be more visible. Grab your transparency tool and partially hide the top of each shape created in the previous step. The result should be subtle. Another nice effect that can be added is reflection. To do so, you must create new shapes on areas that are extremely exposed to the light source. Once again, select the transparency tool and hide the bottom part of each shape. As you can see on the illustration above, the head is colored with a lighter tone of grey/blue. Finally, you can improve your illustration even more by changing the color of the outlines of the rat drawing. For the nose and the tail, a darker orange color can be used. For the rest of the character, a darker blue color is a good choice.